Designed to reflect curriculum expectations, these programs encourage the development of students’ abilities to comprehend, negotiate, and derive meaning from visual information contained in artworks. Students experience a variety of artworks in the gallery and develop a greater appreciation for the composition of visual forms by focusing on the elements of design. Discussion takes place around an artist’s personal style, choice of subject matter, and individual interpretive response to the work. Students probe the creative process through a sampling of works on view in a variety of mediums, including painting, drawing, printmaking, and sculpture. Storytelling and handling of objects are used to emphasize the connection between visual forms and the artists’ immediate cultural and physical environments. Through storytelling and guided viewing of artworks, students discover the multicultural mosaic of The Art of Canada* and explore the importance of traditions and one’s geographical environment in the shaping of identity. Hands-on activities are used to further engage younger grades. Through close observation, interactive activities and focused discussions, students develop their understanding of the principles of design in practice, as well as the various ways in which artists use visual language to communicate emotions and ideas. A great overview of the McMichael Collection and various genres of art. Landscapes, portraits and abstract art are examined, encouraging students to consider the position and tradition of these genres within specific cultural and historical contexts. Through examples of artistic and cultural diversity at the gallery, students explore art as an expression of personal experience as well as the country’s collective history. During the tour, various historical issues are explored through animated discussions and debates, including industrialization, the impact of the Great War on Canada’s sense of nationhood, and the Assimilation Policy and Indigenous Cultural Appropriation. Students engage in a formal analysis of artworks followed by an examination of their cultural and social contexts, and participate in a moderated debate. The argument is based on personal response, interpretation, and ideas about the impact that artworks can have on individuals and communities at large. All Tours, Art-in-Action Workshops, and Signature Studios can be applied across various areas of the curriculum. 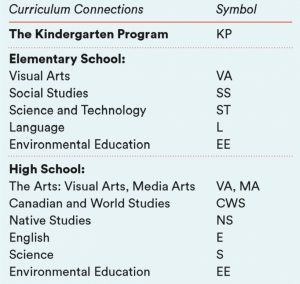 Use the legend below to identify curriculum connections within each program to ensure all your expectations are met.